These 22 ounce Square Plastic Containers fit together perfectly to maximize your display space. 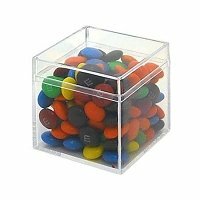 When used as candy containers, they work perfectly on a counter top or shelving, just fill with individual snacks, lollipops, any small merchandise in these plastic jars to entice customers to buy. Use these small containers for decorating for outdoor events in a non-breakable format. 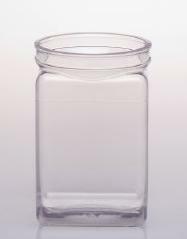 Plastic square jars also work well as a small vase, fill them with candy as giveaways or party favors! 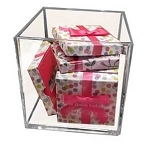 Make sales rise and profits climb to the top, order your wholesale plastic candy jar. What are you waiting for? Order yours today at All Candy Containers.